Today was supposed to be a good day. No, a GREAT day. Instead, it turned out to be a day reminiscent of Tim “The Toolman” Taylor. We were excited because we were finally going to get to move The Beast into her new home. We needed her assistance, because she’s 11.5 feet tall… and we needed to get the lights installed and wired in her fancy-schmancy new home. That happens to be 15.5 feet tall. She seemed to be exactly what we needed to Do It Ourselves. Mister got in to the Beast and fired her up, and was able to wriggle her around at the side of the house, avoiding THREE sewer valves the city installed within 20 feet of each other. And not in a straight line either. Which seems so random and weird, but… it’s the city. I did my part in making sure Mister did not take out the eave on the side of the house, smash into the stucco wall with the motorcycle lift, and made sure he avoided all three sewer valves. I was very carefully watching as he came down near the drive way, to ensure the front left-hand corner of The Beast did not get too close to the ground (since it was coming down at a sharp angle). It looked questionable there for a minute. And as I breathed a sigh of relief that all seemed to be fine and in the clear, I heard a nice, long, LOUD…. “CRACKKKKKKKKKKKKKKKKK… CRUNCH, CRUNCH, CRACK”. As I looked down, and gasped, Mister slammed on the air brakes (as he was crawling out of the driveway at a speedy 3mph) and gave me this “WHAT?!?!?!!! !” look. I had watched as his front left tire ran over the rather thick looking plastic water meter cover. Nothing seemed to be wrong, so I told him nevermind, all was well and to go on ahead. He eased the Beast out of the driveway, and headed down the street to make a u-turn in the intersection at the end of our block. It’s a big, and very quiet street, so I was watching as he carefully made his 3-point Y-turn. And then there was a gurgle. I looked down at the water meter box just as a huge gush of brownish water came surging out of it. For a moment I thought it was a sewer connection, and I said a few lot of bad words in my head, and I think possibly out loud, as I wondered what on earth I should do while waiting for Mister to come back up the street. My first instinct was to stop the yucky brown water from gushing out, but there was no way was I going to stick my hand in it. I waited for the foul odor that I was sure would hit my sniffer at any moment… but that never came because it really was just WATER. It felt like forever before Mister drove back up the street, and when he did all I could do was point at the water rushing up from the ground. He just shook his head, raised his hands and gave me an “I can’t do anything about it right now” irritated gesture. As quickly as we could, we got the Beast into her home, and ran out to look at the damage. I called the Public Works department, and told them what we had done and that it seemed to be broke on their side. They said they would send an emergency crew out. Mister somehow managed to get our side of the water shut off, and we got to work on getting the lights done. About 45 minutes later the city was there working on the problem. About 20 minutes after that, another city truck was out. They had about 5 guys working on it, and at one point I saw one guy had dug a hole so deep just his head was sticking out of it. And then…. The Motorcycle Police man showed up. I told Mister, who was struggling with the lights on top of the Beast, that the cops were at the house. He was really surprised by that, but we kept working away. Until the cop came to talk to us. Turns out the city had called them and told them we had a hit-and-run on our property. We told the officer exactly what had happened, and that we had NOT performed a hit-and-run on our own property. (WE called it in for crying out loud.) He took a report and so now we’ll have to deal with the City on this issue next week. Just LOVELY. Mister was having to hold the light, screw it in, while balancing himself against the ceiling. Which means he had to do it all by touch, rather than sight. Along with the stress of the water issue, we had to deal with the lighting situation. Mister is 6’1″, so the four feet clearance he had while on top of the motor home kept him stooped over. Not to mention, he was in a deep knee bend pretty much every time he had to try and get the lights installed. 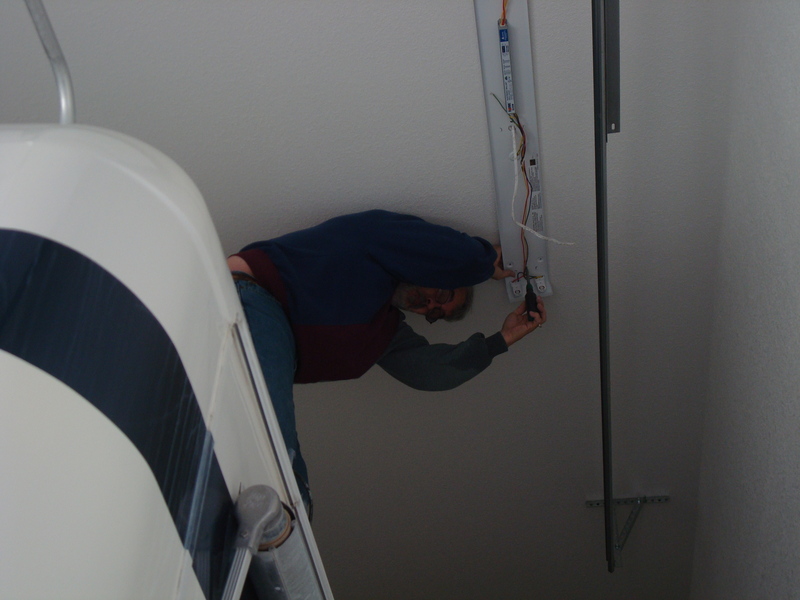 Which was no easy feat, given that each light was to be installed about a foot and a half from the edge of the motor home. 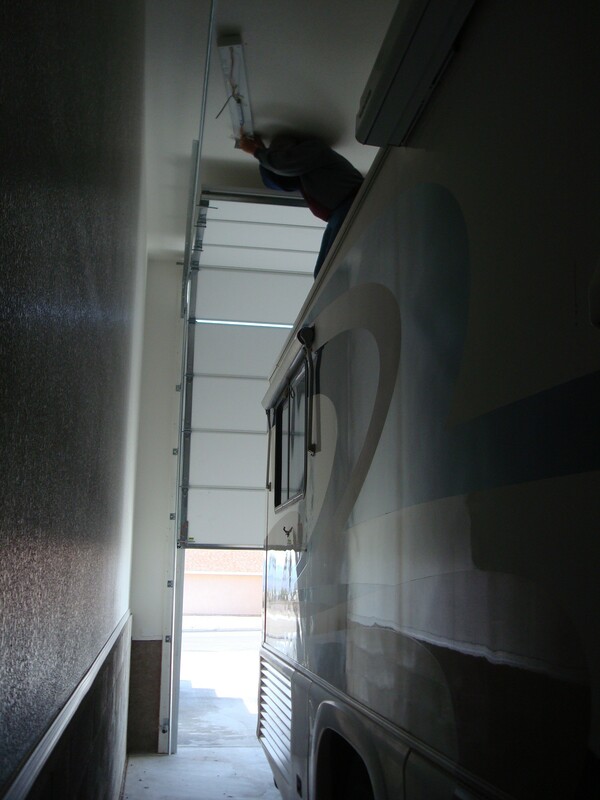 It was too difficult to get the motor home to one side or the other of the garage, so he pretty much had to lean over the edge. After almost dropping the first light while trying to screw it in, I told him I would help him. I figured it would not be anything like being on the roof of the house, since the ceiling was there, as well as the garage door being partially opened (and something I could hold on to for balance). It also didn’t look like Mister was having to lean over very far either, so I figured it would be easy-peasy. And I was SO VERY WRONG about that. I know I have a fear of heights. What I didn’t realize was how paralyzing and panic-inducing that fear was. Certainly anyone who is scared of heights could be very frightened by being on the roof of a house. Especially trying to get down a ladder that is not permanently attached. 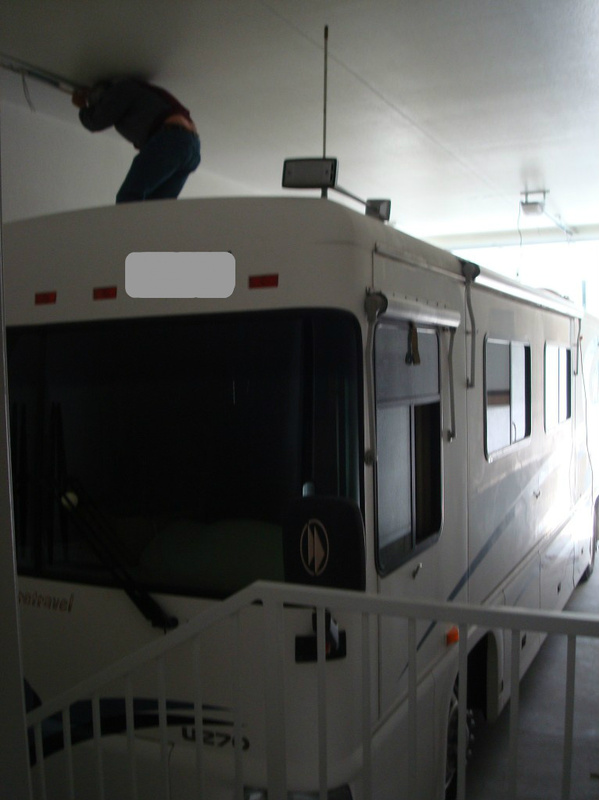 But being on top of a sturdy motor home with a screwed on ladder? I didn’t think that would be a problem. Until I tried to help him hold the light. I inched as close to the edge of the Beast as I could (it has a curved top; NOT helpful to those who are afraid they’ll lose their footing and slip). I was actually behind Mister, with my head and neck firmly planted against the ceiling, left arm gripping the top of the opened garage door, and right hand extended over the edge and holding up the light. I told myself not to look down, and I didn’t. Then I felt all the blood drain from my face, my entire body went as cold as ice, my knees started shaking, and the arm holding the light fixture started trembling. My eyes were shut tight, and I think I even whimpered a time or two, trying to hold the tears back. Mister was telling me I was doing exactly what he needed me to do and he was able to get the light installed. Which helped me from losing it completely up there. When he told me I could let go, I went straight to the middle of the coach and sat down. I was very close to a real panic-attack, and had to focus on becoming calm. I told Mister I could not do that again, and offered instead to just be the “gopher”. I was terrified of losing my balance, grabbing him, knocking us both off-balance and sending us tumbling to the floor. He agreed that my “gopher-ing” would be more helpful, and on the ground is where I spent the rest of the day. Except for climbing halfway up the ladder to hand him things, which was very manageable. Mister managed to get all four lights installed (one near each corner of the garage) without falling off. It was very difficult to watch him straining to hold up the light, drill the holes, get the lag bolts in, and firmly screw the lights up while hunched over and in a partial squat. His neck, back, and legs were very tired at the end of the day, but he’s been able to rest. Even though our electrician did not get the electricity hooked up to the garage yet (like he was supposed to by YESTERDAY), Mister was still able to test his lights and outlet work. So we know we are set for our part of the final inspection. Which was supposed to be done Monday, but thanks to our dear electrician is now rescheduled for Tuesday. To say that we are glad this particular day in our Dash is over would be an understatement. Life happens, obstacles pop up, and you just have to deal with them and move on. I am grateful for no trips to the E.R. and that Mister resisted the very strong temptation to get all smart-assy when the police officer patronizingly asked him, “So, what did you LEARN today? ?” That could have made this day a bit more worse. I certainly did restrain myself for the nice police officer who is still learning tact. AFTER all the note-taking, insurance and registration-taking, he explains that the city worker who called it in as a “delayed hit and run” was likely trying to do us a favor of not having to hassle with the city over whose fault it was that it broke. I told him, since he had asked, that it was I…and said I wasn’t going to lie to him. My thought is that it was the city who improperly had the “protective” cover resting on what it was supposed to protect, instead of elevated, thus making it transfer the weight of the wheel to the plastic pipe. I guess we shall see eventually whether I get to be right or not. Oh my gosh! What a day you two had, that’s crazy. Wish I could have been there to help. On the other hand, this will make a great story/memory at some point in the future for you. 🙂 Sorry you were so terrified up there, I know how awful that feels. She was such a trooper, she kept offering to come back up and help. Sure couldn’t ask for a better helper. She did a lot of running around to avoid me having to go up and down the motorhome. I’d still be out there working, had it not been for her help. It was kinda fun wire-nutting an appliance cord to the circuits in the garages to check them and then plugging it into an extension cord from the house. I also learned that the outside house outlet I used to run the extension cord is NOT GFI’d! I think maybe tomorrow I’ll check the RV outlet and the Garage Door openers…see if those work ok. You know me and electric boxes…..
A nice, smooth existence would be too boring to bear, Christine. Consider yourself lucky!